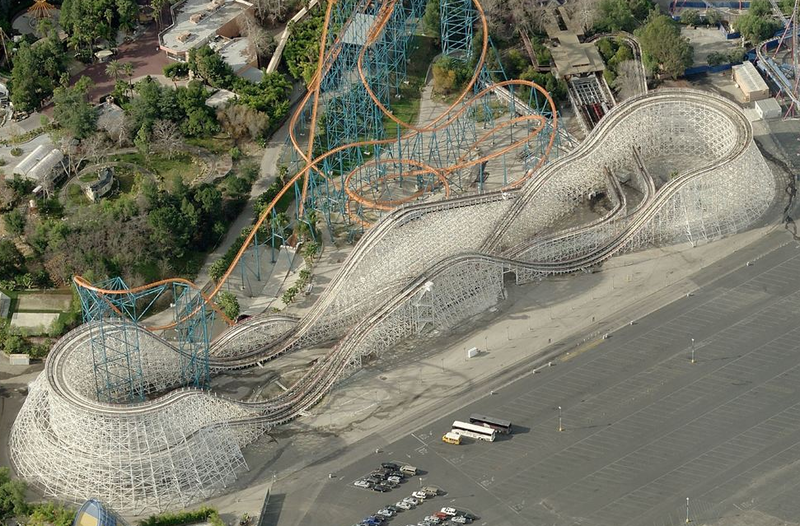 36 years was a good run, but Six Flags Magic Mountain has announced that Colossus will be closing on August 16th, 2014. The giant racing wooden roller coaster opened in 1979 and features two side by side tracks that each run over 4,300 feet long. Colossus has seen major changes and reprofilings throughout the years, taking what started as a rather thrilling ride and taming it down little by little. While many have a soft spot for the ride in their hearts, it's been growing less popular over the years. From the enthusiast side of things, Colossus ranked #116 in 2013's Best Wood Coaster Poll, falling from #60 the first time the poll was done in 1994. As to why the ride is closing in the middle of the park's busy season, well, rumors have existed for almost a year now that Colossus is next in line to receive a Rocky Mountain Construction makeover. Just like the New Texas Giant, Iron Rattler, and now Steel Medusa, Colossus is rumored to ditch its wooden track and instead become a wild steel coaster. Coincidentally I asked our readers last year what Six Flags coaster should be next to be transformed, and Colossus was the run away winner. For now the park is only saying that they will announced "exciting future plans" at a later date. Until we know more, make sure you get your final rides in before August 16th!